Strong Multimedia All-rounder. Less than 600 Euro (~$770), but equipped with a quad-core CPU and dual graphics. That sounds like a cheap gaming-ready multimedia notebook. Is that what Acer is offering in the Aspire V3-551G-1048G50Makk? We will find out in our review. The list of V3 notebooks on the Acer homepage includes a lot of models which use Intel hardware. A closer look is required to discern the single AMD model from the crowd - the Aspire V3-551G-10468G50Makk. We previously tested two models from this series: the 15.6-inch Aspire V3-571G-73614G50Makk and the 17.3-inch Aspire V3-771G-7361161.12TBDCakk. Now it's time to take a look at the first model with AMD hardware. Our test model is equipped with an AMD A10-4600M APU (quad-core CPU, Radeon HD 7660G). The APU is accompanied by 8 GB of RAM. The integrated GPU does not work alone and is paired with the dedicated AMD Radeon HD 7670M GPU. Files are stored on a 500 GB hard disk. A DVD burner is also available. For the sake of comparison, we will include the sister model, the Aspire V3-571G-73614G50Makk (Intel Core i7-3610QM, Nvidia GeForce GT 640M), the very similarly specced HP Pavilion g7-2051sg (AMD A10-4600M, AMD Radeon HD 7660G + HD 7670M Dual Graphics) and the Fujitsu Lifebook AH532(Intel Core i5-3210M, Nvidia GeForce GT 640M LE) in this review. All the Aspire V3 models have a black and silver look. The black piano finish is a magnet for scratches and fingerprints. 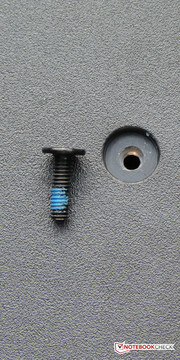 A maintenance flap is present at the bottom. 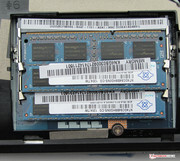 The case of the Aspire V3-551G-10468G50Makk is identical to its Intel based sibling, the Aspire V3-571G-73614G50Makk. 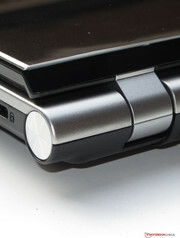 The back of the display, the screen bezel and the hand-rest regions have a glossy piano finish. This makes these areas a magnet for smudges and fingerprints, and the user should always have a cleaning cloth at his/her disposal. Overall, this is not an appealing look and the laptop comes off looking cheap. The top of the base unit (with the exception of the hand-rest areas) look far better. 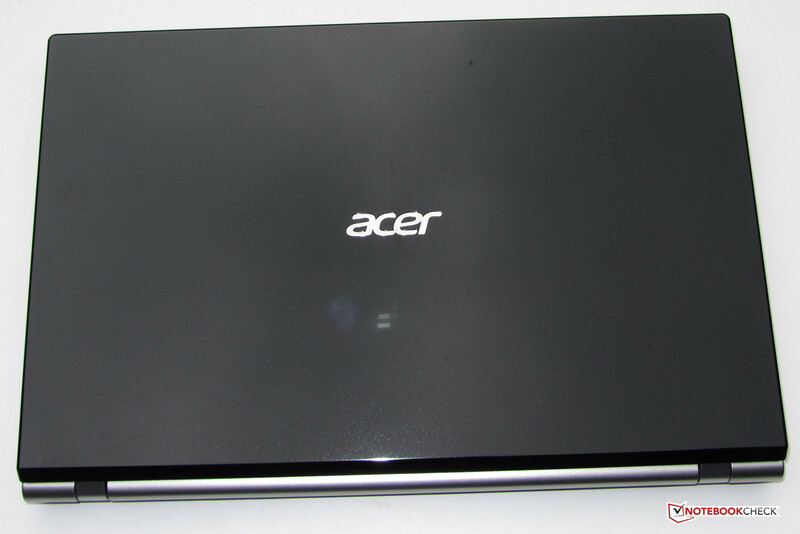 Acer employs a matte silver synthetic material which gives the laptop a metallic look. 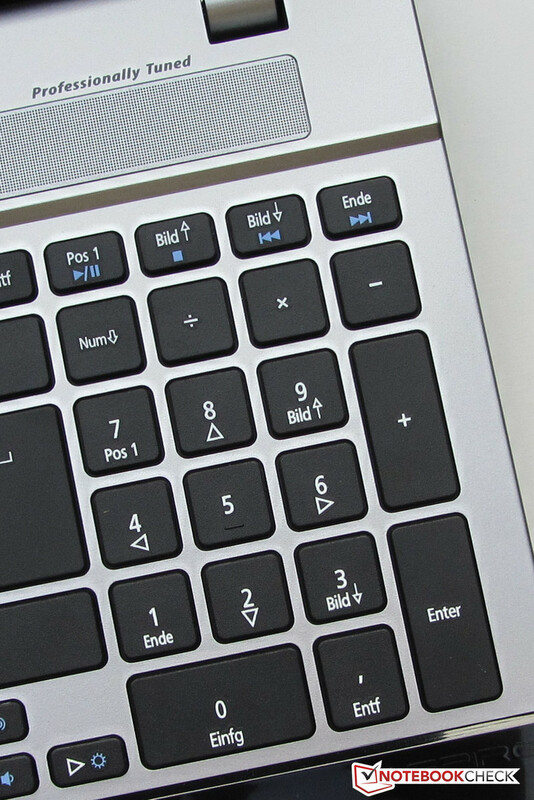 The silver material considerably improves the look of the laptop making it seem more high-quality. We would like to note that there are cheaper synthetic material builds. The sturdiness of the case is decent. The base does not give way too much under pressure. The regions around the touchpad and the optical drive are more susceptible to flexing. The case has satisfactory workmanship, but there are a few slip-ups. 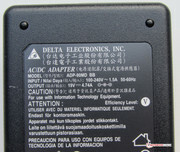 For example, both the base and the display cover have a sharp edge. The cover should have been stronger. It can be easily bent inwards, especially near the bottom. The hinges hold the display well, but tend to let it slip. The laptop cannot be opened with one hand. The ports and their distribution are identical to that of the Aspire V3-571G-73614G50Makk. All ports, which are required nowadays, are provided. However, the positioning is not ideal. Almost all the interfaces are seated near the front. This means that they are easy to reach, but can also lead to an annoying clutter of cables next to the laptop. The front is occupied by a card reader which supports SD, MMC, Memory Stick, Memory Stick Pro, xD. All the communication modules of our test model come from Atheros. Acer has picked the AR8151 model to serve as the Gigabit Ethernet chip. 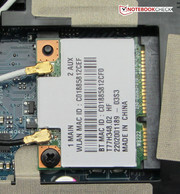 The WLAN module is dubbed the AR5BWB222. It supports the 802.11 a/g/n standards. 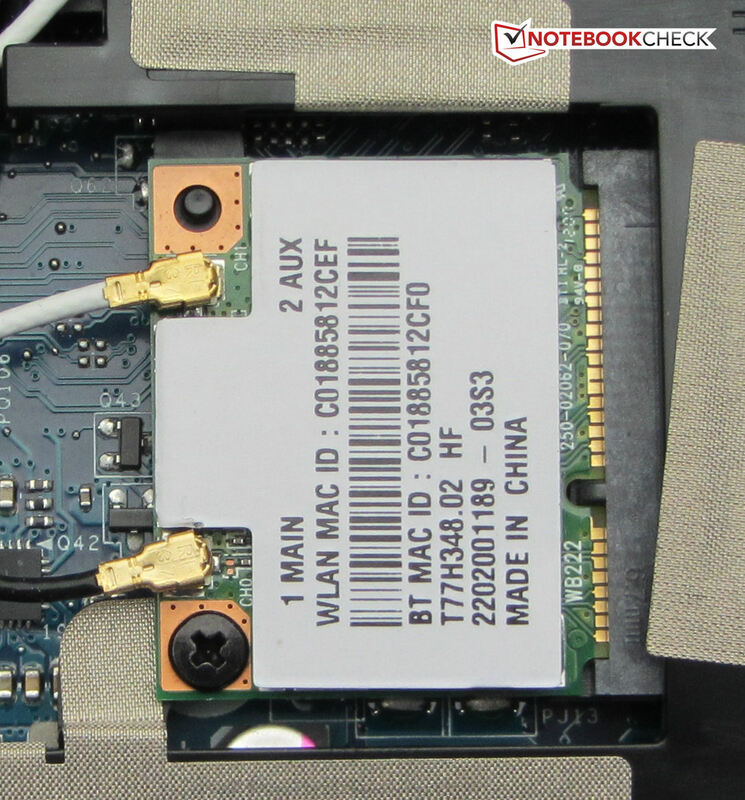 The notebook even has space for an Atheros Bluetooth chip. This is placed above the WLAN and supports Bluetooth 4.0. Users of VoIP services will be happy with the integrated webcam (1.3 MP). Skype is already installed during first boot. The laptop box contains the usual accessories: a few manuals, the warranty and security information, and a quick installation poster. That's it. The laptop has Windows 7 Home Premium (64 bit) pre-installed. A Window 7 DVD is not provided with the notebook. Recovery is possible via the Recovery partition. The use of the Recovery system is quite easy: right after the laptop starts, the Recovery system can be accessed by pressing "Alt" + "F10". The user can then reset the laptop to factory settings. It is possible to keep the user data. Of course, this will not matter if the hard disk is swapped out for a Solid State Disk. In that case, a Windows 7 installation DVD would be required. Here the reader can find out how to get a full-version Windows 7 DVD for free. McAfee Internet Security Suite (60-day test version) takes care of the security needs of the laptop. The Microsoft Office 2010 Starter version is also installed alongside Windows Live Essentials 2011 (which contains an E-Mail program and video editing software). As mentioned earlier, Skype can also be found on the notebook. The laptop also has Cyberlink Media espresso. This can convert media files into formats supported by Smartphones, tablets and/or gaming consoles. Acer has also installed a plethora of its own tools on the laptop. The buyer can look forward to making an image of their hard disk using the Acer Backup Manager. 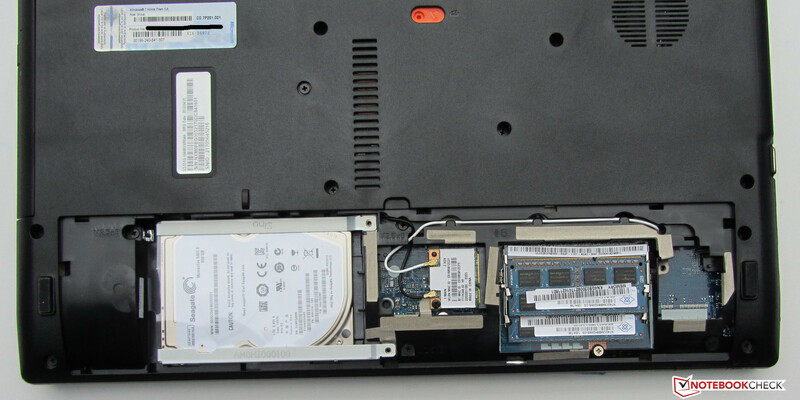 A flap on the bottom of the notebook grants access to the hard disk, the RAM and the WLAN module. The fan cannot be reached. 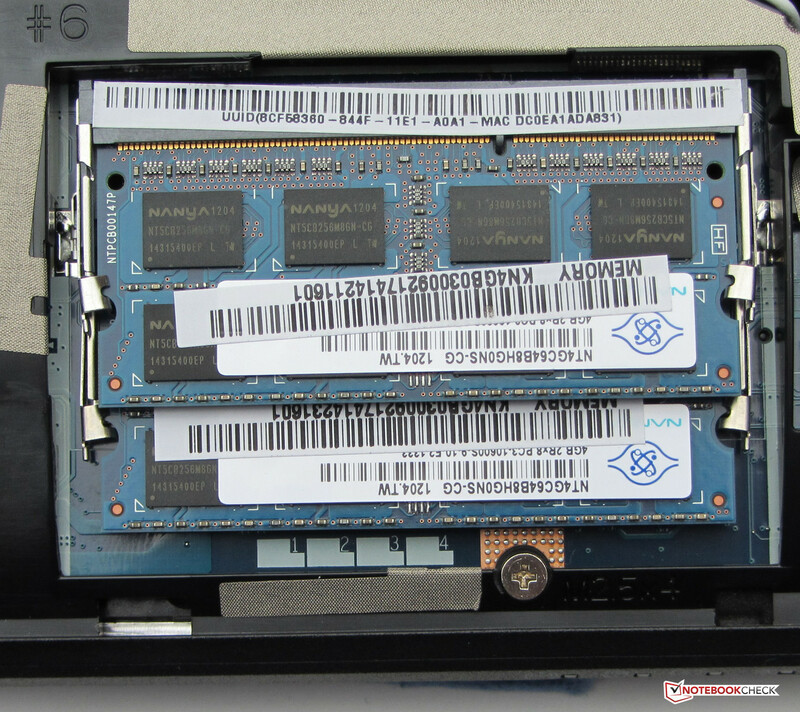 The laptop has two RAM slots, both of which are occupied (2 x 4 GB). The user cannot upgrade this further as the laptop supports a maximum of 8 GB RAM. The installed hard disk can be easily swapped out. Simply take out the hard disk, put in the new one in the hard disk cage and put the screws back in. You are done. Acer provides 24 months Pickup and Return warranty for the Aspire V3-551G-10468G50Makk (Acer will pick up the laptop from the buyer). This standard warranty can be extended: an extension up to 3 years can be bought for around 60 Euro (~$77). However, this must be purchased and activated within 90 days of buying the laptop. Acer has installed a chiclet keyboard in the Aspire V3-551G. The main keys measure 15 mm x 15 mm and are placed 4 mm apart. There is no keyboard backlight. 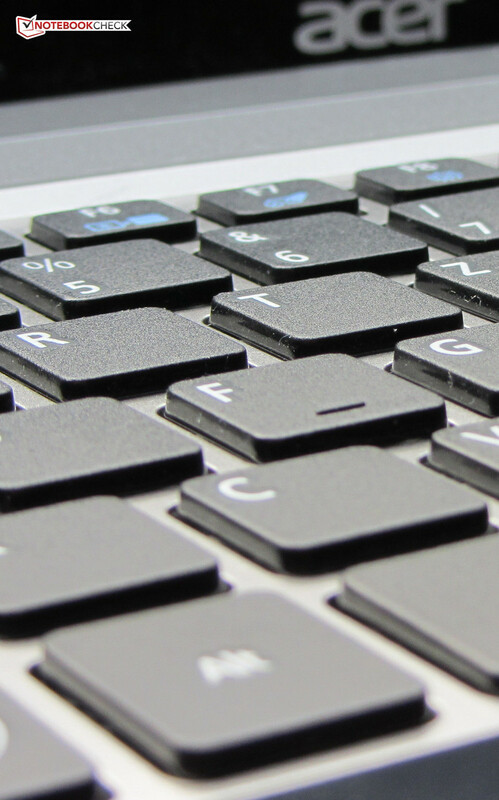 The keyboard gives way slightly under pressure, and is especially susceptible to flex near the optical drive. Overall it offers a comfortable typing experience. The keys have a medium stroke distance and a nice pressure point. 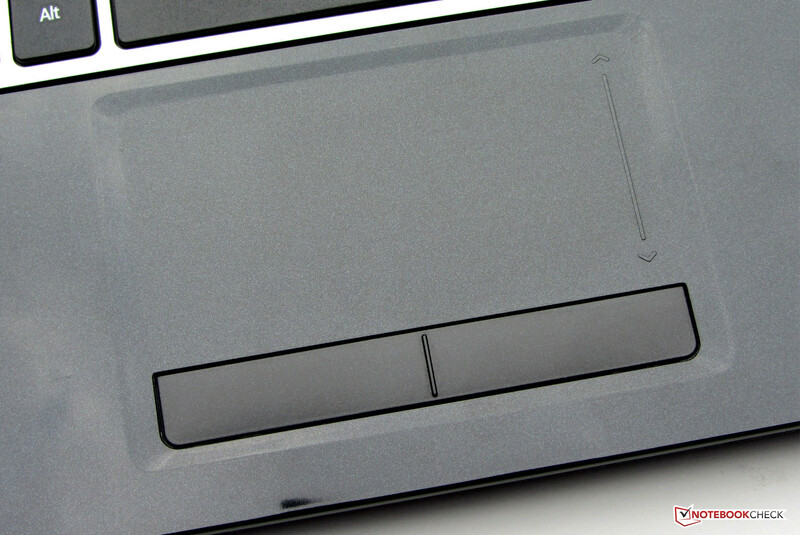 The touchpad (50 mm x 95 mm) is recessed from the rest of the hand-rest area. The roughened surface does not prevent the finger from sliding. This model is a multi-touch touchpad and supports functions like zooming into pictures with two fingers. As in the Aspire V3-571G-73614G50Makk, the Tap-to-Click sensitivity is set too high. Multiple times, an action was executed although we just wanted to move the cursor. The sensitivity can be reduced in the settings. 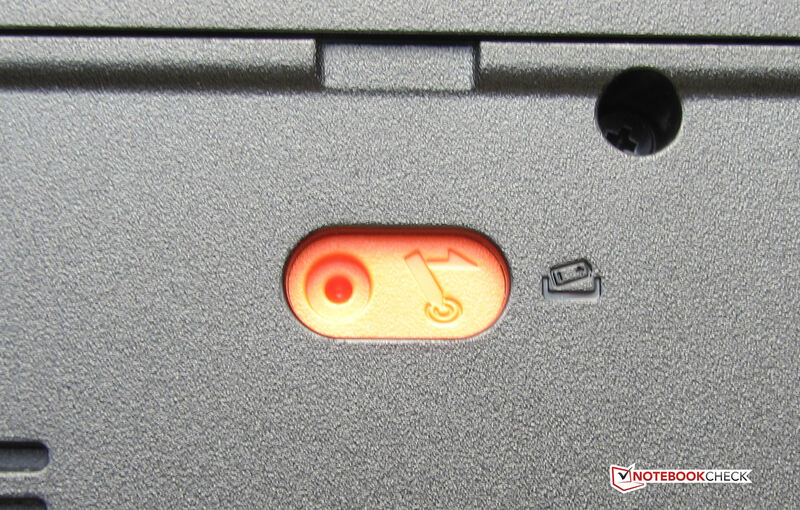 Both mouse keys are placed below the touchpad and have a very weak pressure point. 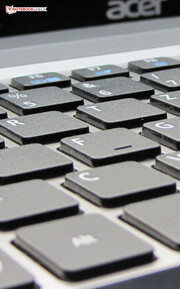 The keyboard provides a comfortable typing experience. The touchpad is a little too sensitive. 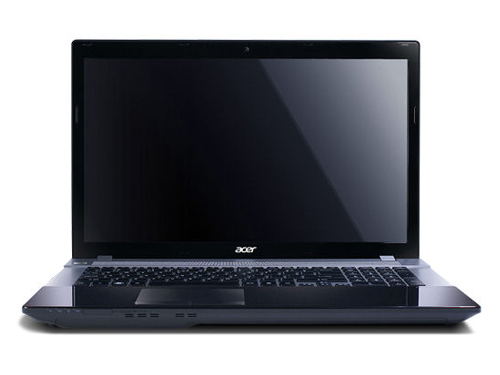 Acer has equipped the Aspire V3-551G with a 15.6-inch display which has a native resolution of 1366x768 pixels. The display surface is reflective. This is an LED screen and Acer does not offer alternatives for the Aspire V3-551G. The average brightness of the screen is quite modest at 190.8 cd/m². The Aspire V3-571G-73614G50Makk is slightly better with a screen brightness of 197 cd/m². The Fujitsu Lifebook AH532 is worse with an average brightness of 173.9 cd/m². The black value of 1.02 cd/m² is average as well. This applies to the contrast too which comes in at 194:1. Both these values should have been better. The Aspire V3-571G-73614G50Makk is worse at 1.55 cd/m² and 132:1, and the Fujitsu Lifebook AH532 (1.02 cd/m² and 178:1) lies at a similar level as the Aspire V3-551G-10468G50Makk. 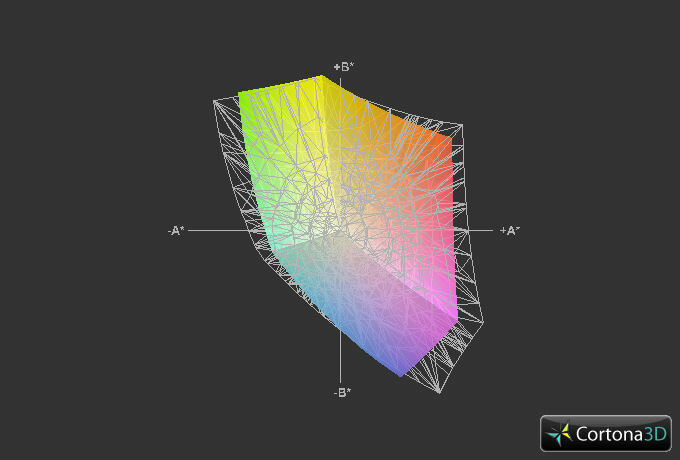 The sRGB and AdobeRGB color space coverage is non-existent. However, this should not be a problem as these are only required for professional graphics editing. The Aspire V3-551G-10468G50Makk is not made for outdoors use. The reflective display and low brightness make the screen content illegible outdoors. However, the laptop can be used in very dark spots. The viewing angles of the Aspire V3-551G-10468G50Makk are like those of many other laptops. If the angle changes vertically, the picture quality quickly drops. Horizontally, the picture quality remains stable over a much larger angle. It is possible for multiple viewers to watch a video on this screen. The Aspire V3-551G-10468G50Makk being used outdoors. 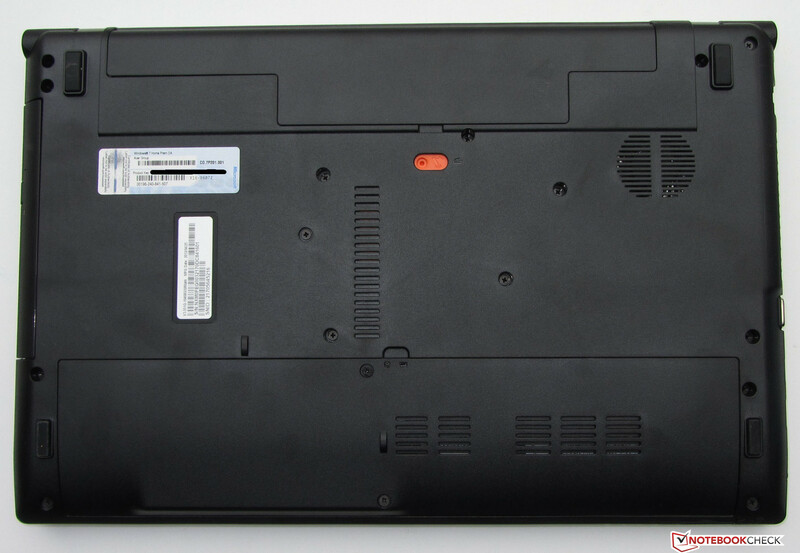 Viewing angles of the Acer Aspire V3-551G-10468G50Makk. The Acer Aspire V3-551G-10468G50Makk is a multimedia notebook. This means that everyday tasks such as surfing on the Internet, VoIP, playing YouTube videos or performing office functions are not a challenge for this model. The installed CPU and two GPUs make playing games possible. Of course, the performance is sufficient to play Blu-Ray discs, but the test model is not equipped with such a drive. We recommend swapping out the installed DVD burner for a Blu-Ray drive if the user requires it. Both GPUs are capable of playing Blu-Ray discs. They have an integrated video encoder (AMD UVD3 decoder). This takes care of all the work while playing videos and does it very well. We ran a test video (Full HD resolution, H.264 coding) on the Aspire V3-551G-10468G50Makk and observed the CPU load. The load remained clearly under 10%, and often dropped to 0. We saw a similar trend while playing YouTube videos of the same resolution. Acer has installed an APU (Accelerated Processing Unit) in the Aspire V3-551G-10468G50Makk. The APU is a combination of a CPU and a GPU and originates from AMD. The APU of our test model is named the AMD A10-4600M. The CPU part is composed of a quad-core CPU with a base clock speed of 2.3 GHz. AMD Turbo Core allows the boosting of the clock speed up to 3.2 GHz. During our stress test (Prime95 and Furmark running simultaneously) the speed of the CPU fluctuated wildly (with the power adapter connected). The speeds ranged from 1800 MHz to 2700 MHz, and the four cores did not run at the same speed as each other. In fact, each core individually fluctuated in the above-mentioned range. The dual-graphics ran at 335 MHz. Now and then, the speed briefly rose to 500 MHz or 685 MHz. On battery mode, all cores ran at a constant 2.3 GHz. The dual-graphics ran permanently at 277 MHz. We confirmed two trends during the Cinebench test. 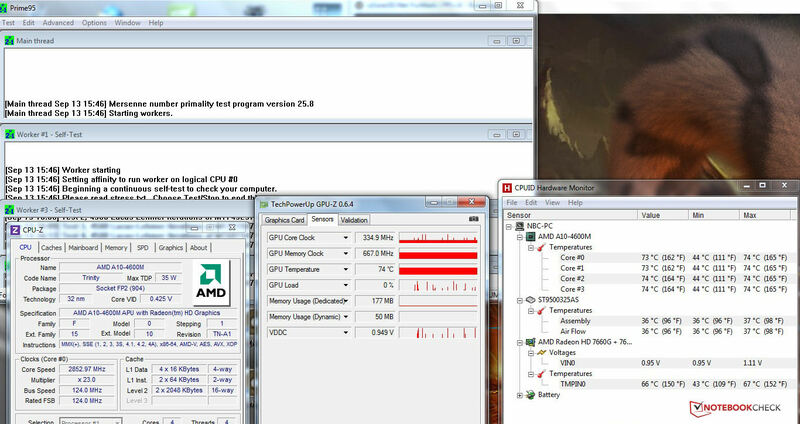 In the single thread test, the CPU ran at a constant 2.7 GHz (all four cores). In the multi-thread test the CPU cores operated at various speeds and continuously fluctuated between 2.3 and 2.7 GHz. Despite all this, the performance is at the expected level. To introduce the Trinity platform, AMD provided us with a notebook with an A10-4600M APU specifically made for performance testing. This notebook delivered similar results as our test model. However, in the GL tests, the Aspire V3-551G-10468G50Makk lagged behind the above-mentioned laptop - despite the dual-graphics. The performance of the dual-graphics system heavily depends on the driver support and the game/program being run. This can lead to a 10-15% lower performance than systems with a single GPU. The Aspire V3-551G-10468G50Makk can only stay on par with the Aspire V3-571G-73614G50Makk (Intel Core i7-3610QM, Nvidia GeForce GT 640M) in the GL tests of the Cinebench 10 benchmark. In other benchmarks, it is clearly the runner-up. 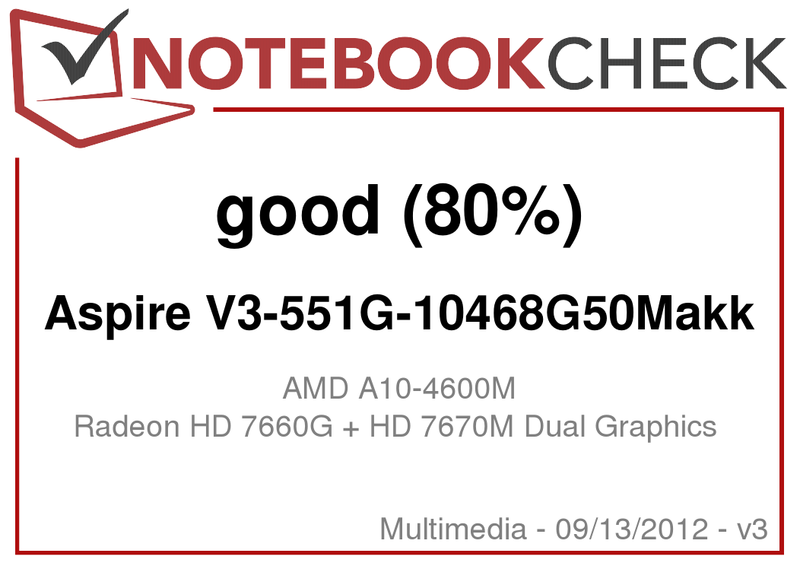 The scores of the HP Pavilion g7-2051sg (AMD A10-4600M, AMD Radeon HD 7660G + HD 7670M Dual Graphics) are almost identical to those of the Aspire V3-551G. The system performance is decent. However, the high access times of the hard disk are noticeable in everyday use. This leads to programs being started after a slight delay. The score in PC Mark Vantage was also below our expectations. This is probably because the laptop does not permanently use Turbo. The HP Pavilion g7-2051sg (AMD A10-4600M, AMD Radeon HD 7660G + HD 7670M Dual Graphics) has similar hardware but a much higher score. The Aspire V3-571G-73614G50Makk (Intel Core i7-3610QM, Nvidia GeForce GT 640M) and the Fujitsu Lifebook AH532 (Intel Core i5-3210M, Nvidia GeForce GT 640M LE) are far ahead of the Aspire V3-551. Our test model is equipped with a hard disk from the Seagate Momentus 5400.6 series. The hard disk has a capacity of 500 GB and runs at a speed of 5400 rpm. The average transfer speed of 63.2 MB/s is modest. The access time is quite high at 19.3 ms. These numbers affect everyday use. The opening of applications is a little delayed. A gaming-ready multimedia laptop should have a faster hard disk as no user wants to wait very long for a game to start. The Aspire V3-551G is equipped with dual-graphics. This system is composed of the integrated AMD Radeon HD 7660G GPU and the discrete AMD Radeon HD 7670M chip. The two GPUs support DirectX 11 and process the workload together. This creates a problem when the frame rate is around 30 fps as micro-stutters turn up. More information about the AMD Radeon HD 7660G + HD 7670M combination can be found in the FAQ. During our stress test (Prime95 and Furmark running simultaneously), the dual-GPU system operated almost entirely at 335 MHz. The speed occasionally rose to 500 and 685 MHz. In battery mode, the two GPUs ran at a constant 277 MHz. 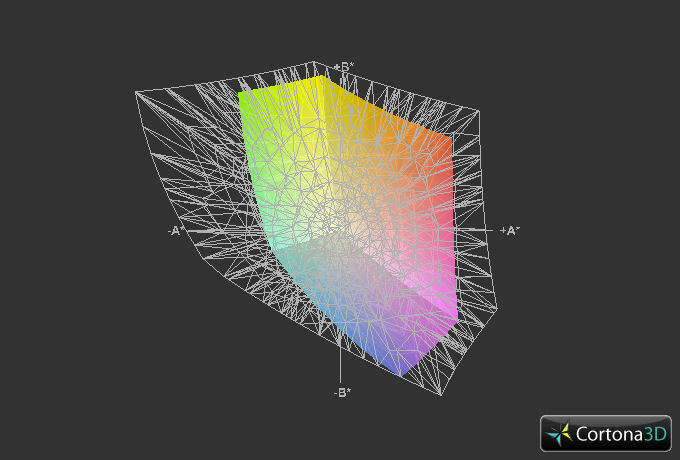 The results are mirrored by the 3D Mark benchmarks. The HP Pavilion g7-2051sg (AMD A10-4600M, AMD Radeon HD 7660G + HD 7670M Dual Graphics) scored higher in a few areas. The Aspire V3-551G could not keep up with the Aspire V3-571G-73614G50Makk (Intel Core i7-3610QM, Nvidia GeForce GT 640M) in the 3D Mark 11 benchmark. The reason being that in 3DMark 06 and 3DMark Vantage, the CPU performance strongly influences the final score. The CPU component of the A10-4600M APU is not as strong as the Intel Core i7-3610QM. We would expect a laptop with a quad-core CPU and dual-graphics to be able to run games without a problem. The games we tested ran at medium settings at the native resolution of 1366x768 pixels and were mostly fluid. Some games even ran smoothly at high settings. The frame rates were not as high as those of the Aspire V3-571G-73614G50Makk (Intel Core i7-3610QM, NVIDIA GeForce GT 640M). We have provided a table to show the difference in performance between the dual-graphics system and the A10-4600 APU with no additional dedicated GPU. We performed this comparison using the Trinity test platform provided to us by AMD. On average, the Aspire V3-551G-10468G50Makk can deliver 20% higher frame rates. 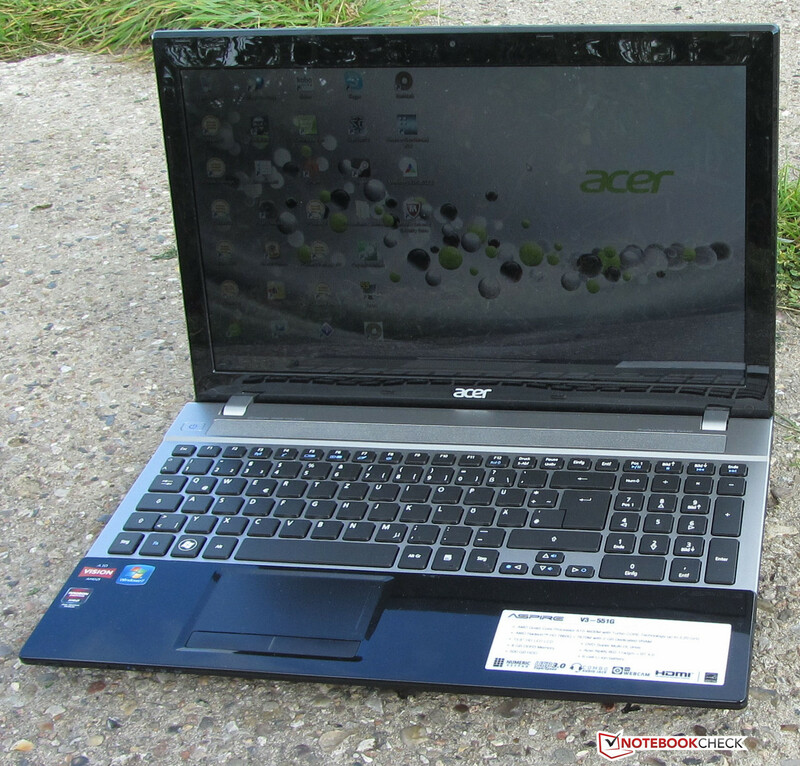 The Acer Aspire V3-551G is a gaming-ready notebook which is quiet most of the time. While idle, the noise emission is at a constant 33.4 dB. The fan often switches off and then only the hard disk emits noise. At full load (Prime95 and Furmark), the emissions remains in the quiet region: 37.1 dB. Overall, the Aspire V3-551G-10468G50Makk is a little quieter than the Aspire V3-571G-73614G50Makk. The Fujitsu Lifebook AH532 is just as quiet while idle, but at load, it gets much louder than the other two models. The Acer Aspire V3-551G-10468G50Makk in the stress test. The temperatures remained in the green region while the laptop was idle. The top and bottom temperatures ranged between 27.6 and 35.8 degrees Celsius. These temperatures make it possible to work comfortably with the notebook on the lap. At full load, the temperature range between 27.2 to 50.3 degrees Celsius. The bottom heats up to 50.3 degrees Celsius near the fan. The temperatures near the left hand-rest region and the touchpad were clearly above 40 degrees Celsius. At this point, the laptop could not be used as comfortably as before. During the stress test (Prime95 and Furmark run for one hour) with the power cable connected, the CPU speed dropped heavily. We could measure speeds between 1800 MHz and 2700 MHz. Each CPU core fluctuated individually across this range. The two GPUs operated at 335 MHz, but were known to jump up to 500 MHz/685 MHz for a second. On the battery, the CPU cores stayed constant at 2.3 GHz. The two GPUs ran at a constant 277 MHz. The temperatures peaked at 73/74 degrees Celsius. (-) The average temperature for the upper side under maximal load is 38.8 °C / 102 F, compared to the average of 30.9 °C / 88 F for the devices in the class Multimedia. (-) The palmrests and touchpad can get very hot to the touch with a maximum of 48.2 °C / 118.8 F.
(-) The average temperature of the palmrest area of similar devices was 29.1 °C / 84.4 F (-19.1 °C / -34.4 F). The speakers above the keyboard are hidden beneath a perforated cover. The sound is a little tinny and has weak bass. This can be improved using the pre-installed Dolby Home Theater software. Overall, the speakers of our test model do not stick out of the crowd of standard notebook speakers. Of course, those users who do not like the sound quality can switch to external speakers or headphones. While idle, the consumption is at a normal 9.3 - 13.4 W. At full load (Prime 95 and Furmark), the power consumption rises to 54.1 W. It rises once again to 80 W if the battery is being charged at full load. 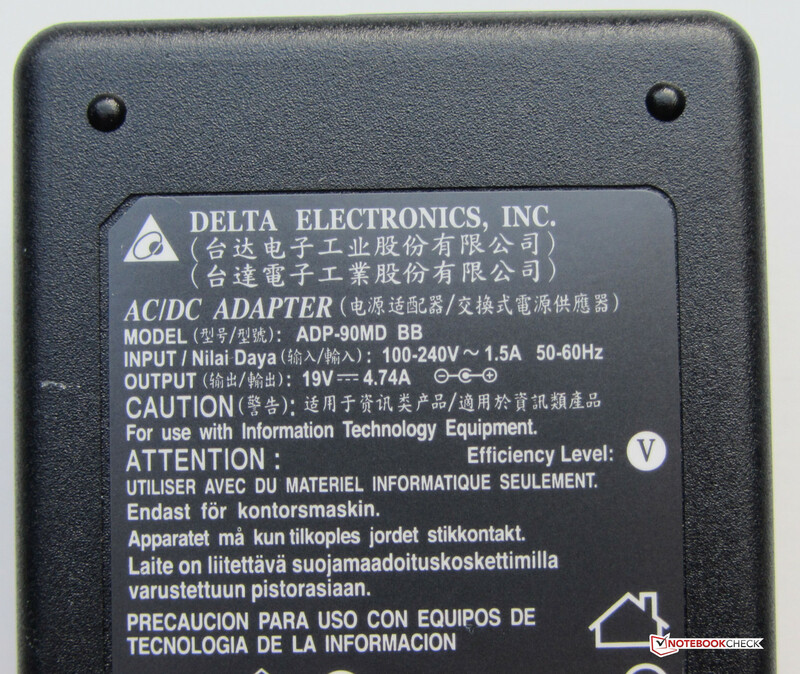 This makes it clear why the manufacturer provided a 90 W power adapter. This level of power consumption places the Aspire V5-551G below the Aspire V5-571G-73614G50Makk (90.7 W). The same is true when the laptop has medium load (3D Mark 06). The Aspire V5-551G requires 52.4 W whereas the Aspire V5-571G takes 75.6 W. The power consumption of the HP Pavilion g7-2051sg is similar to the test model at all times. This is surprising as the HP notebook has a 17.3 inch display. While idle, Aspire V3-551G-10468G50Makk can run up to 7 hours 42 minutes (V3-571G: 7 hours 27 minutes, AH532: 4 hours 30 minutes). We measured this time using the Battery Eater Readers test. For this test, the screen runs at minimum brightness, the energy-saving profile is selected and the wireless modules (WLAN, Bluetooth) are turned off. At load, the Aspire V3-551G-10468G50Makk can run up to 1 hour 17 minutes (V3-571G: 1 hour 30 minutes, AH532: 1 hour 21 minutes). We used the Battery Eater Classic test here. For this test, the screen runs at maximum brightness with all wireless modules turned on and "High Performance" mode selected. During the WLAN test, a full charge could last for 4 hours 22 minutes (V3-571G: 3 hours 16 minutes, AH532: 3 hours 28 minutes). This test runs a script which loads webpages every 40 seconds. The energy-saving profile is slected and the brightness is set around 150 cd/m². The Aspire V3-551G-10368G50Makk ran a good 2 hours 55 minutes (v3-551G: 2 hours 58 minutes, AH532: 3 hours 01 minute) in the DVD test. This is enough time to watch two movies. We set the display to maximum brightness and switched off all wireless modules. 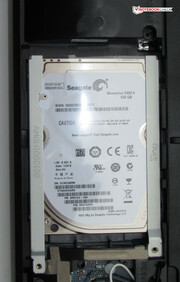 The energy-saving or higher profile (in case the DVD does not run smoothly) is used. The run times of the Aspire V3-551G-10468G50Makk are decent. After all, the laptop has two GPUs and a quad-core processor. The run times of the two Acer models were very close. Our test model takes a clear lead over the Aspire V3-571G-73614G50Makk in the WLAN test. The Fujitsu Lifebook AH532 cannot keep up in idle mode. In the other tree tests, it runs about as long as the Aspire V3-571G. 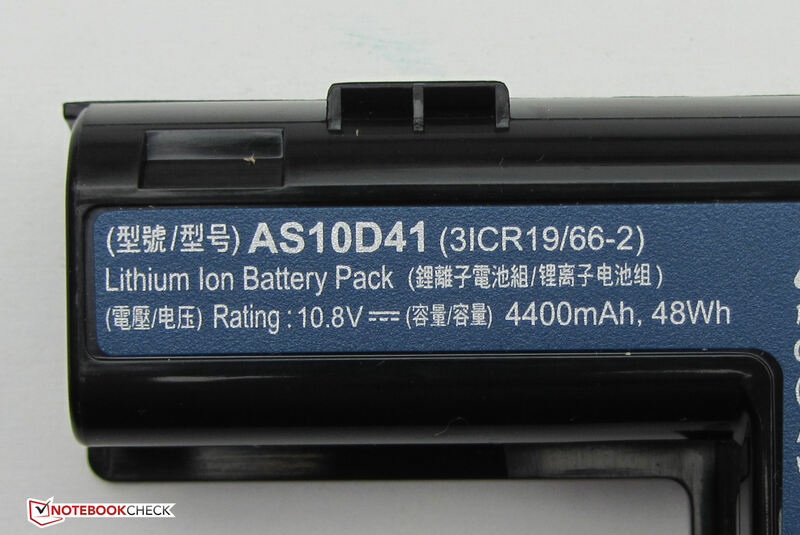 The run times of the three models are easily comparable as all three have a battery capacity of 48 Wh. 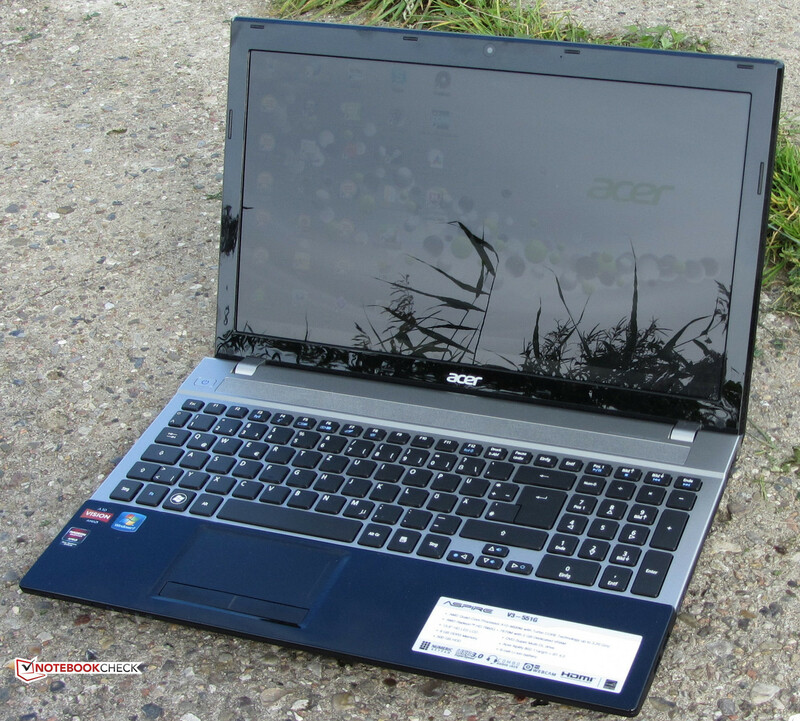 Acer offers a decent multimedia notebook in the Aspire V3-551G-10468G50Makk. This is a laptop which can take care of all your everyday needs. The notebook is even capable of running games at medium and sometimes higher settings. It offers good hardware, long battery life and is always quiet. The model even has a good keyboard. All this is available for less than 600 Euro (~$770). However, there is room for improvement. The maximum performance of the CPU and dual-GPU system is not available at full load. There are also issues with micro-stutters. 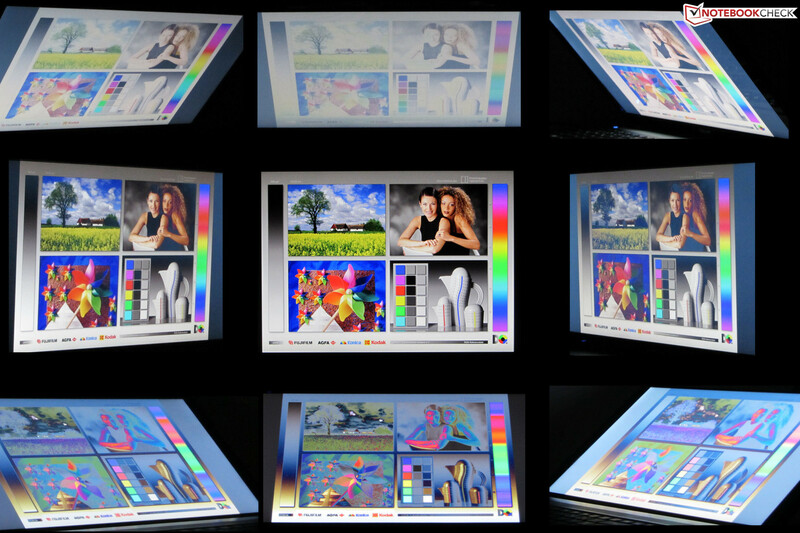 The reflective display limits the use of the laptop to indoors. The consumers, who can live with these flaws, will be happy with this gaming-ready multimedia notebook, which comes at a low price. Those buyers who require more performance can pay 50-100 Euros (~$65 - $130) more for the Intel version, the Aspire V3-571G-73614G50Makk (Intel Core i7-3610QM, NVIDIA GeForce GT 640M) or choose one of the other competitors. The Aspire V3-551G-10468G50Makk is currently the only model of the Aspire V3 series with AMD hardware. ...and has a capacity of 90 W.
The keys have a decent stroke length. The eject handle cannot be missed. ...and you can take out the DVD burner. The WLAN module is not accessible. The notebook has two RAM slots. The bottom has a maintenance flap. The DVD burner reads and writes all the DVD and CD formats. ...hold the display in position. A numeric pad is included. The display content is hard to read, even in the shadows. The good battery life. The good keyboard is a nice feature as well. A brighter display with better contrast. The Aspire V3-551G runs nearly 8 hours despite having a quad-core CPU and two GPUs.